By Amanda Tonoli | June 30, 2018 at 12:01a.m. Akiva Academy at the Jewish Community Center continues former teacher Christina While’s legacy to instill a love of books and reading in its students. While died unexpectedly in October 2017 – a time when she was busy collecting books to bring to less-fortunate children in rural areas in the South. Christina’s husband, Brian While, shook his head remembering the bickering he and his wife would have about where to put the large numbers of books Christina would collect. Shortly after Christina’s death, Brian reached out to Akiva in an attempt to continue his wife’s tradition of giving back in the form of literature. “He said, ‘We have some teacher stuff,’ which we shared with all of our teachers and it just unfolded from there,” said Amanda Hugli, Akiva first-grade teacher and school reading coordinator. Mioni said Akiva took Brian up on his offer without knowing the sheer volume of books his wife had collected. “We wanted to give the books to kids, but then we thought we can do better than that,” Mioni remembered. 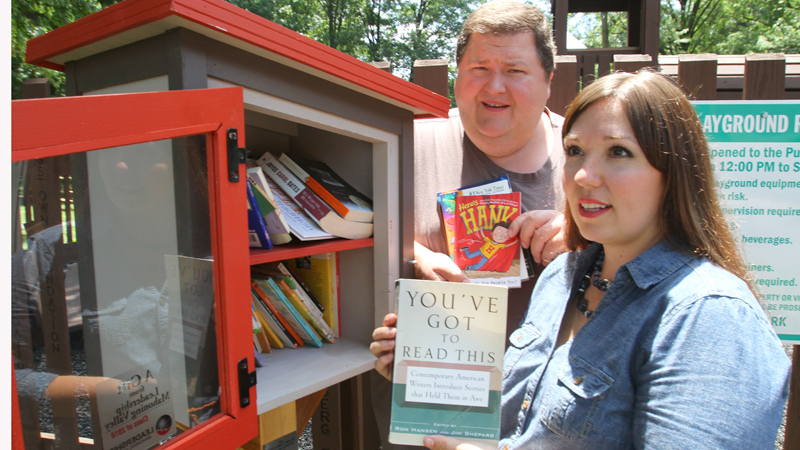 Rather than just give everything away, the books were donated to local pop-up libraries. “It was sacrificial giving to the kids,” Mioni said. And through the books, Christina gets to continue teaching. December 18, 2015 12:05 a.m.
March 7, 2017 10:16 p.m.
November 14, 2012 12:01 a.m.
December 15, 2014 9:55 p.m.